Ever forget to post something and don't remember until you look for the post to link in next months wrap-up? Yeah, less said about that, the better. 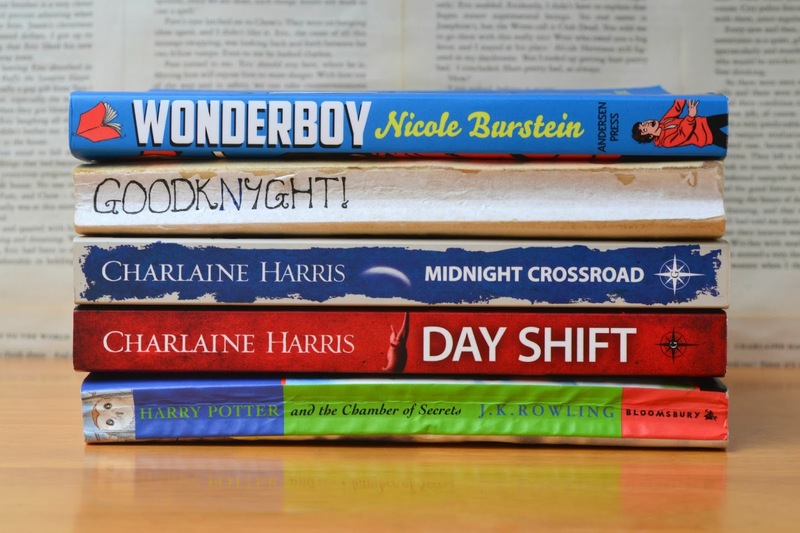 My reading in June can be categorised into two; kids books and Charlaine Harris. And it was a really good reading month! Everything I read, I gave a four stars or more and I'm always excited to get some more Charlaine Harris in my life. Even if they is the last series I have to read before I've finished her entire works, I took them to Greece and they were exactly what I needed. You can read my full review of this on Sabrina's blog here! They looked like the kind of school kids I read about in old adventure books, who drank ginger ale and solved mysteries in their half-term holidays. Hello very battered copy! I find it so funny that I'm so protective of my books now whereas young-me just did not care about anything. Ah youth. This has been so obviously dropped in the bath as well as losing the cover. Anyway, this is a fun kids book where you can also tell that great care has been put in so that adults reading to kids can be entertained too. Humpfrey the Boggart completely went over my head as a kid, as did the reference; "I think thish ish the beginning of a beautiful friendship." But as a grown-up? Loved it! This also isn't a straightforward one-adventure-and-done kind of tale. The twists and turns of this rival some plots of the fantasy books I've read for the YA/adult market. And it had been so long that I had forgotten how this ended, so even I was surprised by the ending. I remember the reason I liked these books so much when I was younger was that while I read a lot of fantasy and adventure as a kid, there wasn't a lot of female characters that were physically strong and involved beyond using their wits. It's great to use your wits- I just wanted the occasional fight too. And this gives me at least one female character, and she's super strong and regularly gets the main male character out of all sorts of bother. So, not superb but overall, it's a great little book from its time. "Well, the fact is, I don't want to be eaten. It's bad for my health." I took the plunge. I finally started Charlaine Harris's latest and only series I haven't yet read, starting with Midnight Crossing. And unsurprisingly, I loved it. Since I've read everything else she's put out, I know a few of the characters and a lot of the lore already. Because of that, reading this was like getting into clothes fresh out of the dryer; soft, warm and fits like a glove. The story is a murder mystery which is, in my opinion, what Charlaine Harris revolves her best books around. However, as always, it's much, much more. I fell in love with this little community in this tiny roadside Texan town. It's very early Welcome to Night Vale feeling with more neighbourly caring. I loved getting to know the inhabitants and seeing how they deal with a murder in their midst. And as always, I loved the writing. It might not be to everyones taste but the cosy crime paranormal domestic drama thing Harris has going on is exactly what I need to curl up with at the end of the day. I will say, my one issue, and this is more an editing thing, is the use of the word 'hermaphrodite' which is wildly outdated. That should've been picked up by someone because the character clearly meant intersex and it wasn't being used as an insult, just a little note to future readers. These are decidedly anti-hateful books which is why it's so out of place, as Bobo says; "I'm pro-gay marriage, pro-choice, pro-environment, pro-whales and tuna and wolves and every damn thing you can think of." Are book boyfriends still a thing? Can Bobo be mine? -their lives altering as this body toppled all their pursuits in a domino effect, and she was profoundly sorry that she was the finger pushing the first tile. I think it took me all of twenty seconds after finishing Midnight Crossing to pick up Day Shift. I was on a roll while I was in Corfu. This was another murder mystery, but had a mini side-plot that doesn't really come to a conclusion and another side-plot that put a bit of pressure on the story. And that might've been what made this slightly less enjoyable to me then the first book. I like the slow pace that Charlaine Harris can take with her cosy mysteries. I like the fact that this small town is generally not busy- so making it busy feels very strange. However, it's very much more of the same. The little Texan community pulling together to support their own, domestic drama and it was good to meet an old favourite from the Sookie Stackhouse books again! I think the side plots will end up playing out in the third book as well, and just thinking about it has me itching to pick up the last book in the trilogy. I can't believe after Night Shift that I'll have read every series by Charlaine Harris. I need recommendations for an author that can fill the gap ASAP. What is there to say about the Harry Potter books that hasn't already been said? For those who don't follow me on Twitter, I tweeted some thoughts as I re-listened to this and can basically sum up my entire experience into a complete confusion of how the wizarding world works. And also, I forgot how scary the monster was in the Stephen Fry audiobook! I'm a grown-up and was spooked, kid-me must've been much braver. What did you read way back in June? Can you remember?